WHEAT FLOUR, SALT, DEXTRIN, SPICE, GLUCOSE, SUGAR, LACTOSE, SOY SAUCE POWDER, CHICKEN EXTRACT, SAKE POWDER, GARLIC POWDER, EDIBLE VEGETABLE OIL, SPRING ONION EXTRACT POWDER, YEAST EXTRACT POWDER, EGG WHITE POWDER, FLAVOR ENHANCER(621), EMULSIFIER (473, 322), PAPRIKA OLEORESIN, SPICE EXTRACT. 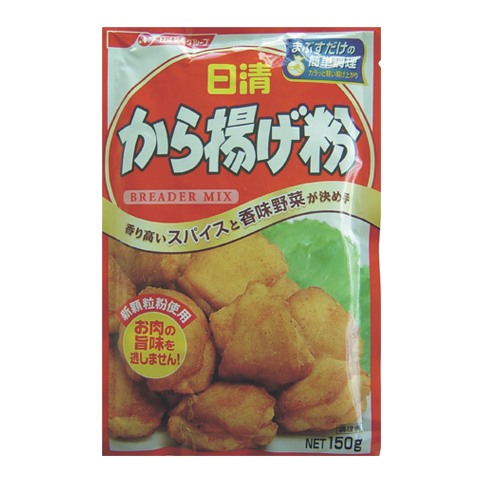 Coat favourite meat, fish or vegetables with BREADER MIX FLOUR and leave for 3 minutes. Heat oil 170CÂ°~180 CÂ°. Deep fry until cooked.